The first episode has once again left the player hanging on a cliff. Now, after numerous delays help has arrived, Half-Life 2: Episode Two is here to save the day. The last few seconds of Episode One showed the player riding a train away from the exploding City 17. The episode ended with the unbearable light of the blast wave. Episode Two picks up the story right there, with a quick recap of the story so far in a pre-recorded ingame video. Afterwards Gordon finds himself in the derailed train, in the middle of a forest, hearing the voice of Alyx calling his name. With the use of the gravity gun Alyx sets Gordon free, and hands the gun back to the scientist. They both walk up a hill, only to see the destroyed City 17, with a large blue lightning at the center of it. The moment Gordon and Alyx lay eyes on the black remains of the city, a huge portal explosion sends out another blast wave. According to several dialogues, the explosion of City 17 caused the opening of a superportal, through which the earth shall be invaded by a large alien army. 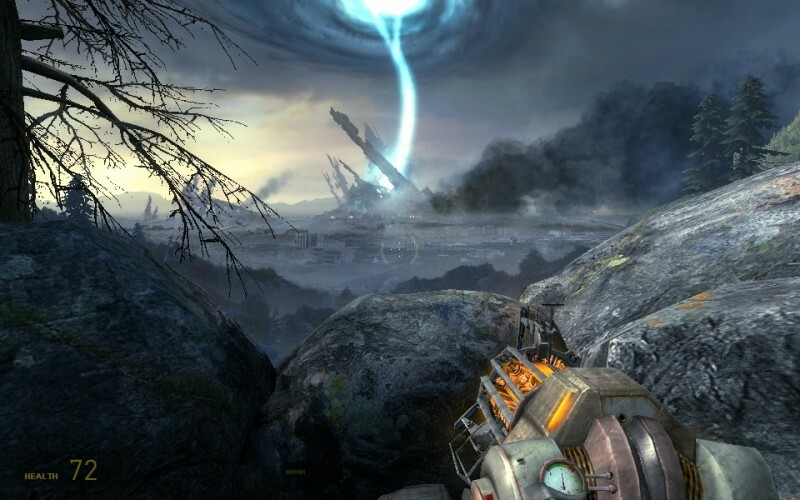 It is the second episode's purpose to lead Gordon towards the prevention of the Combine opening the portal completely. 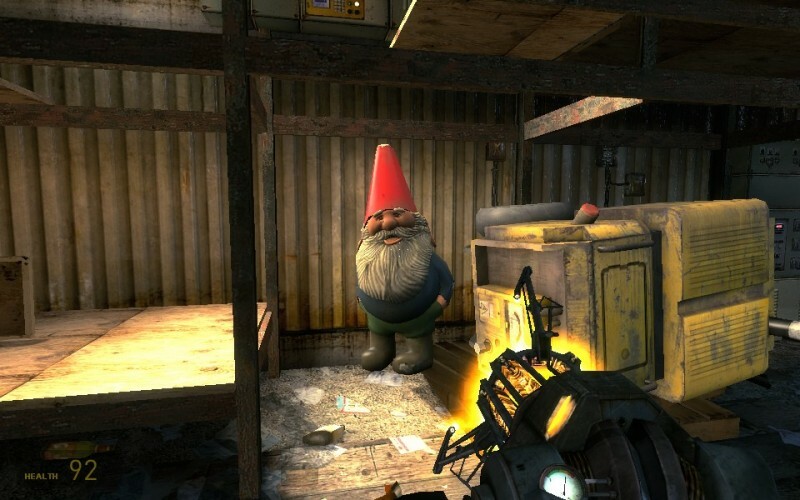 Just like you'd expect from Half-Life, the moment you enter the game, you step into the body of Gordon and you are simply there. The further updated Source engine, paired with exceptional texture work and architecture, creates the perfect illusion. Of course, there are a few really minor drawbacks that remind you that this is still in fact a mere game. Some - especially scripted - animations seem to stutter, some (dead) bodies affected by physics seem to dance with only one leg while lying on the ground between two objects, and of course aliens don't really exist. Right? 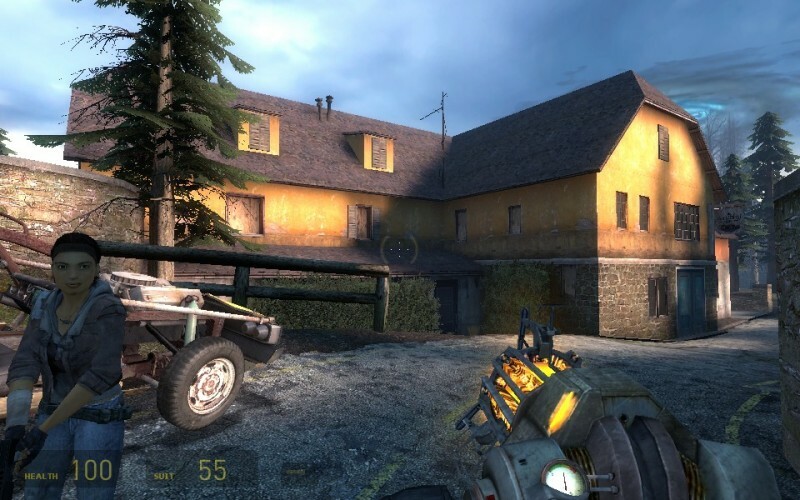 But nevertheless, it is evident that the world of Half-Life was pushed to the next level once more. Basically the second episode doesn't do a lot of new tricks, instead it's obvious Valve took Episode One as a starting point and tried to improve every part. Another bunch of puzzles are thrown at the player, most of them physics based, and easily figured out. There are more of the defend-your-position events, which can sometimes be spotted before getting ambushed by the amount of ammo and health packages lying around. Especially the last base defense is rather epic in scale, which you'll simply have to experience yourself. Throughout the game Gordon gets to drive a new vehicle with tight controls (the handbreak is awesome), you'll get a new weapon device, and you'll spot new enemies, such as a poison spitting bug and the Combine hunter, and get a closer look at one particular opponent you've previously only seen on various monitors - the adviser (basically a giant larva with telekinesis and telepathy abilities). You'll also walk through a lot of large forest areas, including a forsaken village, representing new territory for the Half-Life world. Right at the beginning you're fighting your way through a rather claustrophobic antlion nest. When you finally get out of it you're told to get back inside to get a certain item. Even though you're not going back the exactly same way, this is still the only part that feels slightly stretched, but that's certainly because I hate spiders and sticky nest labyrinths and I simply didn't want to go back (proving that the game succeeds in creating a disgusting environment). But other than that, Episode Two never lets you down. When you're not fighting, there's mostly a bit of dialogue to listen to. Voice acting is once again at its best. Along with the smoothly animated models, they create a lot of different emotions, and thus allowing the player to immerse even more. It's the subtle things that make this game such an amazing experience. Like when you get your new car and hop in, Alyx crawls into the passenger seat through the empty, bent frame of the front shield, then when you look at her sitting next to you she winks in your direction. There's also a new sidekick walking around with you in the bug nest part, one of the alien slaves. His comments are spoken well pronounced and sometimes incredibly hilarious. 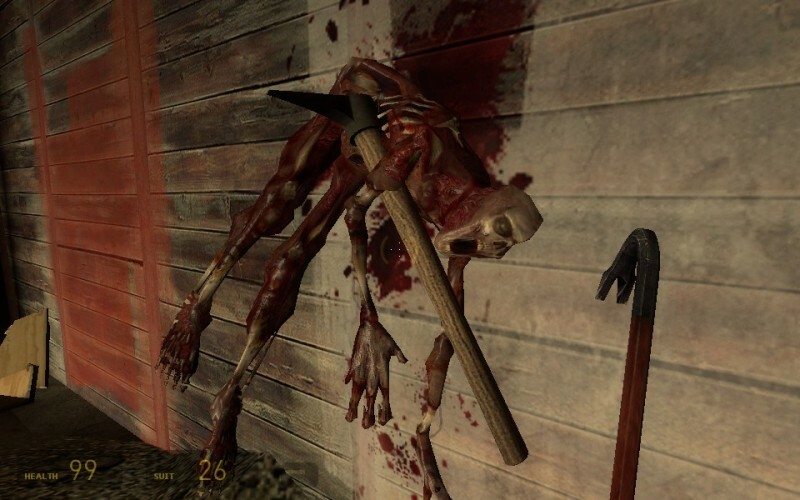 "What would be a pit, without a Freeman climbing out of it," as an example. Next to the excellent voice acting, the sounds of weapons, footsteps, ladders, doors, breaking glass, explosions and so on still remain at the same top notch level we've come to expect. The new soundtrack is a refreshing surprise, even better than in Episode One and a lot better than in the original Half-Life 2. It just hits the spot. Episode Two offers a lot of variety in its six to eight hours of gameplay, spanning over seven chapters. 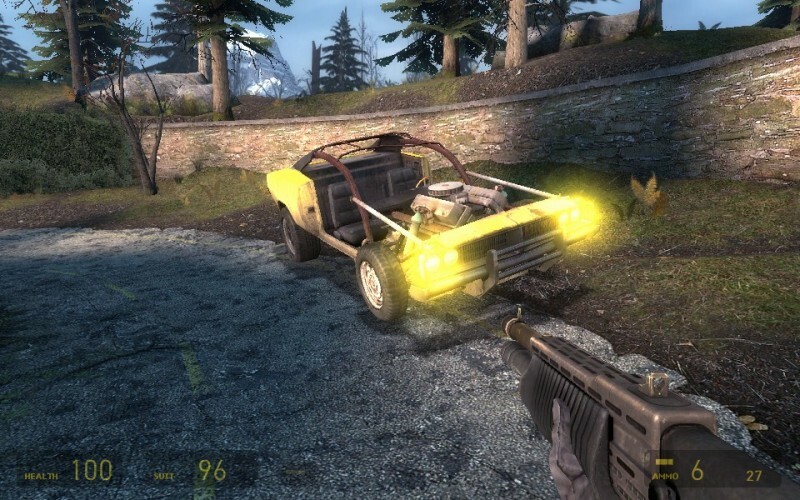 It is a bit longer than its predecessor, and Valve has once again succeeded in improving the franchise even more. There is a newly implemented achievement system, similar to what Xbox 360 users have already come to appreciate in all of their games. It lets you receive badges for squishing all 333 larvae in the game, or killing a Combine zombie with his own grenade, stuff like that. The only sad thing about the ending - apart from one other thing - is that after watching the credits, there is no teaser for Episode Three, and when the main menu comes back it is clear that there's a lot of patience to be had before we can again take control of Gordon Freeman. Luckily, if you purchased The Orange Box, this episode comes packaged with Team Fortress 2 and Portal, both of which make the wait slightly less bitter. Also, near the end of Episode Two the Aparture Science is mentioned, which is the same institute Portal takes place in. I'm sure we're all in for a huge surprise once the final chapter of the Half-Life 2 trilogy arrives.